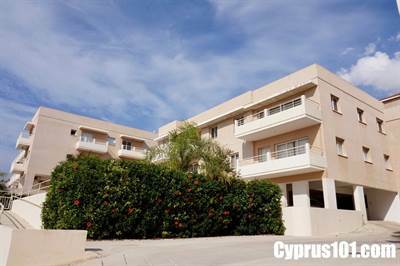 This modern one bedroom apartment is situated in a quiet residential street within walking distance to the village of Peyia and a short drive from the fabulous sandy beaches of Coral Bay. Located on the first floor, this fully furnished apartment features a spacious open plan living room with cosy lounge, dining area and fitted kitchen, plus one double bedroom with fitted wardrobes and a good size family bathroom. From the lounge sliding patio doors provide easy access to a private covered balcony with rural and side sea views. The kitchen is modern with fresh white work surfaces and light wood effect units. Appliances include built-in oven, ceramic hob, fridge/freezer, microwave & washing machine. Views of the coast and mountains can be enjoyed from the complex’s leisure area which benefits from disabled ramp access. Facilities include a kidney shaped swimming pool with surrounding sunbathing terrace and corner shower to the side. ​The property is ideal as a holiday home and has full title deeds. Next → Next post: Townhouse For Sale in Peyia, Paphos Price Reduced!